The serious burden of avoidable adverse outcomes and associated patient dissatisfaction has led to calls for all in healthcare to embrace the quality improvement agenda. Increasing the reliability and safety of healthcare delivery maximises the chances of optimum patient outcomes. It reduces the risk to clinicians and healthcare organisations of complaints, claims, adverse publicity and accreditation or regulatory body censure. Clinical leaders require knowledge and skills extending beyond their clinical expertise into the science of reliability and the academic domains of quality and safety practice. working in small teams to implement a reliability improvement project. A mix of short lectures, facilitated discussions, collaboration in small groups and opportunities for critical reflection. Peer learning occurs through reflective exercises enabling sharing of experience and knowledge. Completion of the Leading Reliability Improvement for Safer Healthcare Workshop. 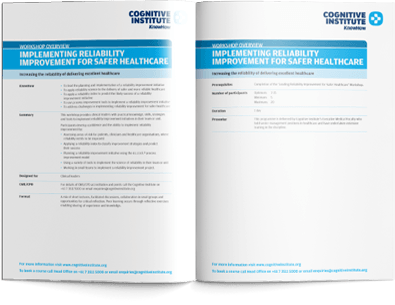 The Implementing Reliability for Safer Healthcare workshop is ideal for clinical leaders. 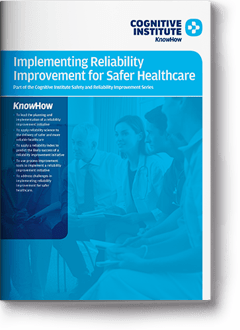 address challenges in implementing reliability improvement for safer healthcare.